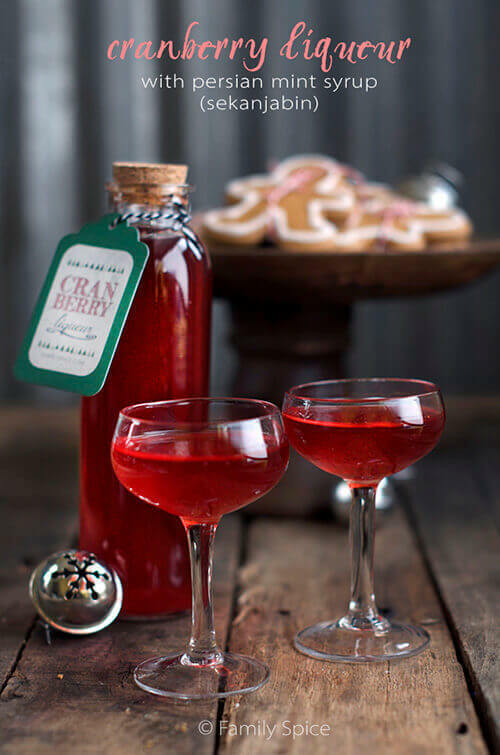 Whether you need a holiday gift or a festive cocktail, this cranberry liqueur with Persian mint syrup (Sekanjabin) is easy to whip up. No matter how hard I try to plan ahead, I seem to scurrying about last minute making and shopping for holiday gifts. I used to be very organized and I never left things to the last minute to finish. Of course, that was before kids. This transformation didn’t happen overnight. It slowly snowballed as I popped out each kid. And as they grew older and our schedules grew into this monster that it is, I find myself frantically procrastinating about my huge to-do list. So if you are like me, then I have a wonderful homemade gift idea for you. In the past, I used to hand out boxes of cookies, cakes and other confectionaries to friends and family as gifts. They were always accepted with open arms. Heck, I love these kinds of high-calorie gifts. Bring it on! But this year, we temporarily put aside our pomegranates and reached for cranberries for our holiday drink. 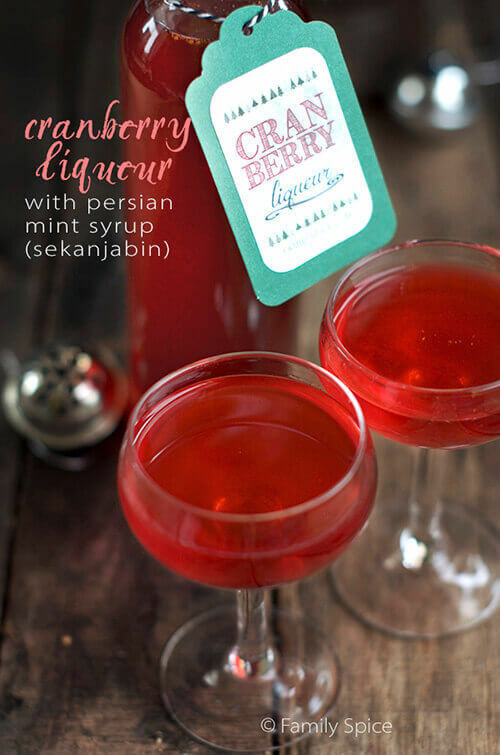 Instead of a simple syrup to sweeten this cranberry liqueur, I used sekanjabin, a Persian mint syrup that is actually a shrub (another great gift idea) since it has vinegar in it. It adds great flavor and not just sweetness. 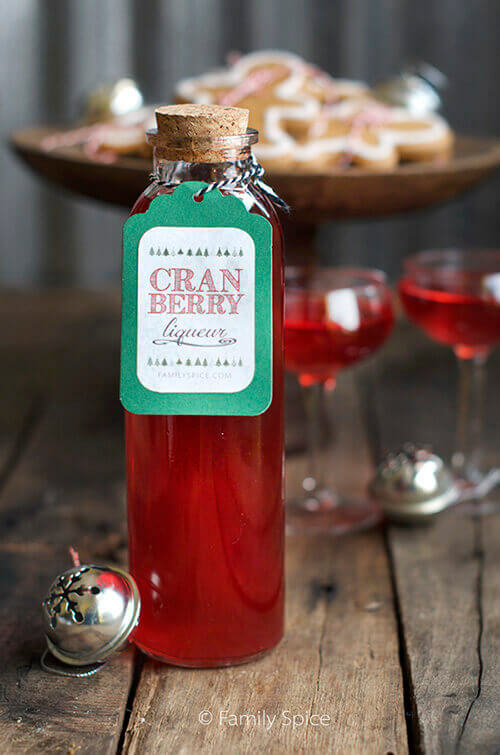 The wonderful thing about this liqueur is that even though the optimum infusing time is 3 weeks, this mix has a strong fruity flavor after 5-7 days. So get to work! 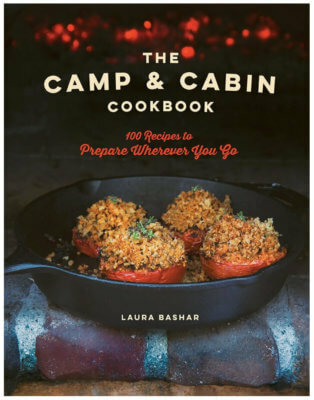 You have plenty of time to throw this together and gift it out way before Christmas! And, like I do every year, I have these cute labels for you to print out for your little bottles. Click here for the label. Enjoy the liqueur alone, or as my husband prefers, with a squeeze of lime. Reduce heat to medium and cook until syrup thickens, about 20-30 minutes. Remove mint when syrup has cooled to room temperature. Pulse mixture until most of the cranberries have been coarsely chopped. You DO NOT want to purée the mix. 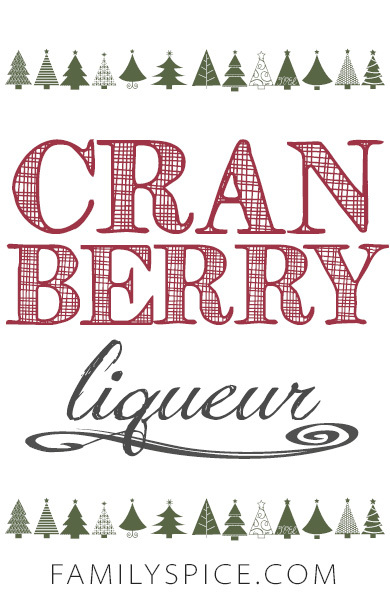 Transfer cranberry mixture into a large jar or wide-mouth bottle. Add lemon skin pieces to cranberry mixture and stir. Seal jar and place in a cool dark place to infuse a minimum of 1 week and up to 3 weeks. Pour cranberry mix into a large bowl through a fine mesh colander to strain out solids. Press the solids through the mesh colander to remove the remaining liquid. 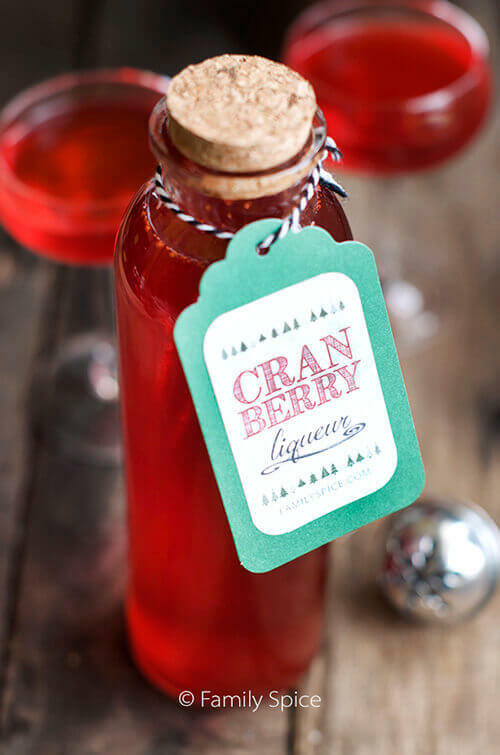 Divide cranberry liqueur into smaller bottles or store in a large bottle. Serving Suggestions: Drink alone or with a squeeze of lime.